If you've been reading this blog for a while, you will know by now that I am a carb lover of all kinds. Making bread at home has kind of become my new thing. I am determined to not buy bread for anything anymore! I have been trying out some new whole grain breads (recipes to come later). 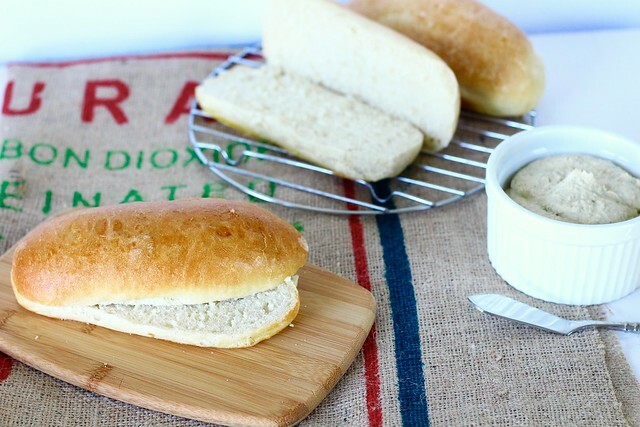 So, when I saw this recipe for hoagie rolls, I knew I had to make them immediately. I would fully agree with Annie (whom I got this recipe from) about how terrible most sandwich rolls can be. I always shy away from them because they tend to tear the roof of my mouth apart. So, I was eager to try these out. They did not disappoint! They were moist, but not so much that they were gummyThey also had just enough crunch to make them the perfect vessel for any type of sandwich. I would recommend weighing your ingredients with any bread recipe. Weighing ensures a better bread. Speaking of sandwich, I made a killer sandwich with these (again, I will be sharing that recipe very soon.) 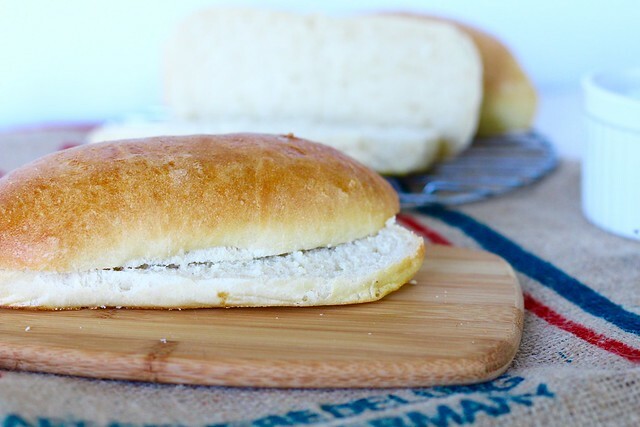 These rolls freeze beautifully. So, make up a batch and throw them in your freezer, or even better, make an amazing sandwich! You'll never go back to store-bought, I promise. 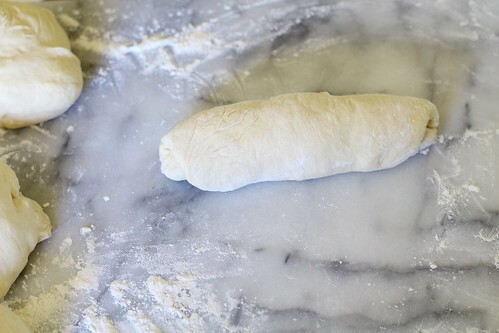 To make the starter, combine the flour and yeast in a medium bowl. 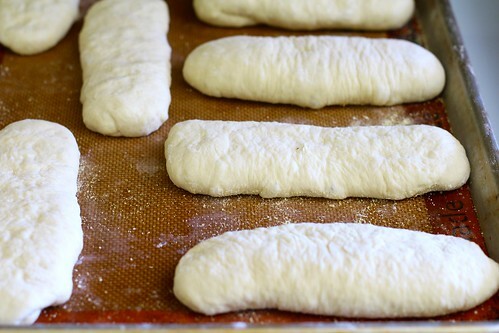 Stir in the water until a rough dough forms. Transfer to a lightly floured work surface and knead briefly. Transfer to a lightly oiled bowl, turning once to coat. Cover and let stand at room temperature for about 3 hours. Transfer to the refrigerator and chill overnight. In the morning, remove the bowl with the starter to the counter and let stand at room temperature at least 1 hour before proceeding. Add in the flour, salt, sugar, yeast, olive oil and 3/4 cup of the water to the bowl with the starter. Stir together until a dough begins to form. (Alternatively, knead with a dough hook in a stand mixer on low speed.) Continue to knead the dough for about 5 to 7 minutes. If needed, add in the remaining water 1 tablespoon at a time until the dough all dry ingredients are incorporated and the dough is smooth and elastic. 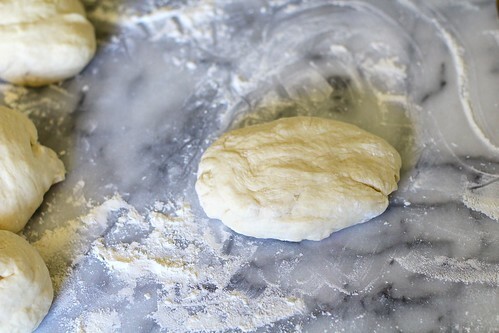 Place the dough in a lightly oiled large bowl, turning once to coat, and cover. Let rise until doubled, about 1 1/2 to 2 hours. Line a large baking sheet with parchment paper and sprinkle lightly with semolina flour or cornmeal. 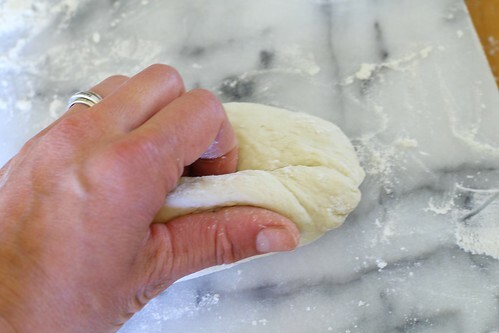 Remove the dough to a lightly floured work surface. Divide into 8 equal pieces (using a kitchen scales ensures equal sized pieces). Flatten each portion into a rough oval shape. Then, roll tightly into a torpedo shape. Pinch the seam shut and place seam side down on the prepared baking sheet, flattening the rolls to about 5 1/2 to 6 inches long by about 2 inches wide. Tent loosely with lightly greased plastic wrap. Let rise at room temperature until the rolls are puffed and nearly doubled, about 1 hour. Place a metal baking pan on the lower rack of the oven. Preheat the oven to 425˚ F. When the oven is fully heated, pour hot water into the metal baking dish to create steam in the oven. Lightly brush the rolls with the egg wash. Use a sharp knife to create a shallow slash lengthwise down the middle of each roll. Transfer the pan to the oven and bake about 17-20 minutes, until the tops are golden brown and the internal temperature measures at least 190˚ F. Transfer to a wire rack to cool.